I have noticed lately that many a small biz (in Chilliwack and elsewhere) tentatively launching into the Twitterverse, perhaps some thinking that they are going where no small business has gone before. I have to tell you that is not the case. If you are just now making your way into the broad expanse of social media virtual landscape known as Twitter – well you are not too late for the party but you are definitely not an early explorer of the galaxy. Here are a few tips to help you catch up with what many of early adopters have discovered. The more you can fit into your Twitter bio the better. Experienced tweeters will check your bio and if it’s empty or hard to understand or is in some other way lacking details, they won’t follow you. You are a scary stranger who may be just waiting to attack or spam or something. Ok, it may not be that. It is most likely just a matter of good practice. The most common advice about following accounts on Twitter is – Check the bio and only follow if it looks both legit and interesting. So fill out you bio completely, add a picture, what your business is about and what city you are in – always helpful. When people click on your profile in Twitter they see your whole page so make it look good. Here is a great design blueprint with image dimensions for pretty much all the popular social media platforms. Bonus tip – if you are doing this yourself and don’t have Photoshop you can use Pixlr a free online photo editor or if you don’t want to go through that mildly steep learning curve you can, in a pinch, use Powerpoint. I use a combination of Powerpoint, Pixlr and Snagit to get just about all my graphic editing done. Once you are using Twitter, how you present yourself becomes the most important thing. Social media is grounded in cooperation ethics and reciprocity is a good strategy. People support people who support them. 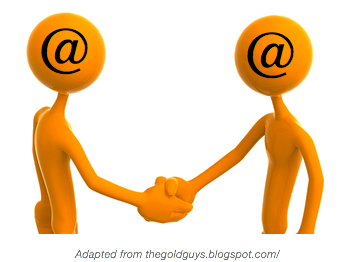 When someone follows you – a potential customer, client or champion of your cause if you are a non-profit – it’s like a virtual handshake. They are holding out their hand as if to say “Hey, nice to meet you”. Not following back is like turning your back on someone that is trying to say hello. There are a few solid reasons for following back. One is that when you follow someone on Twitter it allows them to send you direct messages (DMs). Ironically, this is one of the reasons businesses cite as why they don’t follow back. The other reason some businesses use to explain not following their followers back, is that it increases the “noise” in their home stream. These may be valid excuses for massively popular businesses, brands and celebrities. If you are a small to medium size storefront type of business; these reasons don’t hold up and do more harm than good. One of the best reasons to follow back is so that customers or clients who have something less than positive to say can message you privately. 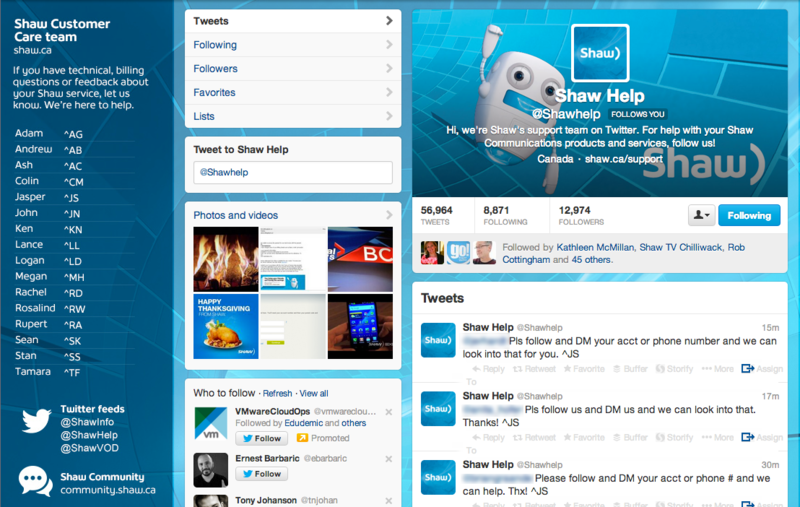 Shaw Cable does this really well by the way. Notice how many people they are following. The other reason businesses don’t follow back, as mentioned above, is the fear of noise. In any business – or non-profit – the act of genuinely listening and hearing what customers, clients and supporters are saying, is critical. Twitter is no exception to that basic rule of engagement. Think of Twitter as an extension of your store or office. Luckily Twitter and applications like Hootsuite make it really easy for you to listen online. Your home “stream” or “feed” in Twitter is where the tweets and retweets sent by the people you follow will show up. “Noise” is all the unwanted and less than relevant posts that can show up in your home stream, making it hard for you to “hear” what’s important. It’s a valid concern and it’s easily addressed. 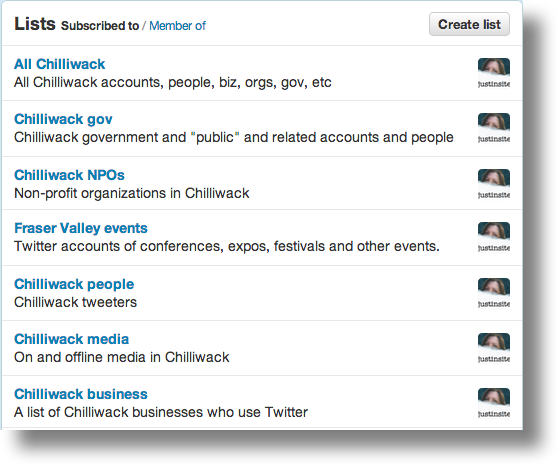 Use lists on Twitter and filtered streams on Hootsuite. Here are some on my lists on Twitter. You can create as many lists as you want, make them public or private and you can put people on more than one list. Hootsuite’s dashboard makes it really easy to follow – listen to – just what’s important and relevant to you, across multiple accounts. You don’t have to try to listen to “everything”. Hootsuite makes it really easy to create list, search and hashtags streams, that are filtered based on what you want to listen for. Once you have introducing yourself and listening down pat the next thing to master is communication. What you say, how you say it, your tone, how often you communicate with your followers should give your followers a good sense of who you are as a brand. Sure you want to promote your business or cause but to do that effectively requires a creative blend of personality, useful content and just plain being nice. 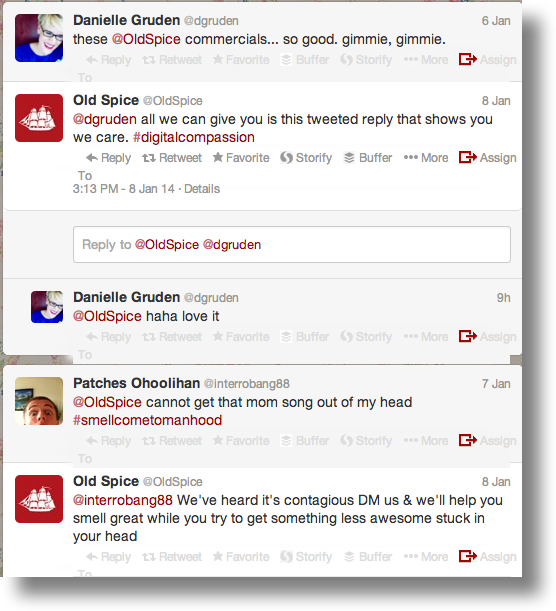 Check out this Hootsuite post about how some of the worlds biggest brands represent themselves on Twitter. My favorite example is Old Spice. They have one of the best Twitter accounts around. You might not have their budget or even their sense of humour on some days but you have to admit – this kind of engagement is good business. The bottom line in business, and in not-for-profit organizations, is always related to doing what works. On Twitter and other social media channels genuine engagement is what works. Engaging your customers, clients, supporters, and champions is more likely to work if your online interactions are as respectful, interesting and engaging as your face to face interactions. So, get out there, dress to impress, say hello, shake some hands, have interesting conversations, offer something of yourself and support others the way you hope they will support you. For more great ideas about using Twitter for business check out this Social Media Examiner post. For specific information about how your business can rock the Twittersphere contact me today. Something I’m curious about is direct messages on twitter. A lot of people use them for a canned “thank you” rather than an interesting message. I don’t check my direct messages anymore because I assume they are just spammy. I also tried using auto-DM’s when working with a company to encourage FB cross-pollination. I didn’t find it useful. Thoughts? When should DM’s be used? Great question! I think my number one Twitter pet peeve is the auto DM. I have never used them. I use DMs for private messages like sending my phone number, making arrangements to chat outside of Twitter, having an extended chat or for more personal messages that would just add noise to followers home feed. I try to DM new followers once I have a chance to look at their profiles and their tweets. I go to great pains to make sure they know my DM to them is not an auto DM. My humble opinion is that the only time to use auto DMs is if you have a massive following, are getting dozens or hundreds or thousands of new followers a day and the DM says something like, “Hi, thanks for following. Sorry about the auto DM.” That might be ok. Econsultancy wrote a great post about this a few years ago. It’s a pretty good list of examples of auto DMs if you absolutely feel you have to use them. If you are getting under 10 or so new followers a day then using an auto DM is a waste of a great opportunity to say hello personally.